Rome has so much to offer! We were advised by our new Roman friend Marco, the owner of Arco dei Tolomei B&B in Trastevere, to celebrate Alex’s approaching milestone birthday at L’Arciliuto Teatro near Piazza Navona. “A very non-traditional place, “said Marco. “You will be enchanted.” And we truly were. “L’Arciliuto” means “archlute” – a wooden string instrument. In Rome, this word means something else to art connoisseurs Ill Teatro della Musica e della Poesia. This is a magical place created by a poet, singer, composer, musicologist, in short, Maestro Enzo Samaritani as the “public garden with music flowers and poetry trees.” This truly unique performance art center is housed in a restored Renaissance Palazzo, which was built inside the ruins of a second century BC Roman villa. The Palazzo was most probably owned by the Dukes of Montevecchio who came from Urbino and whose name is carried by the tiny charming piazza where the building is located. 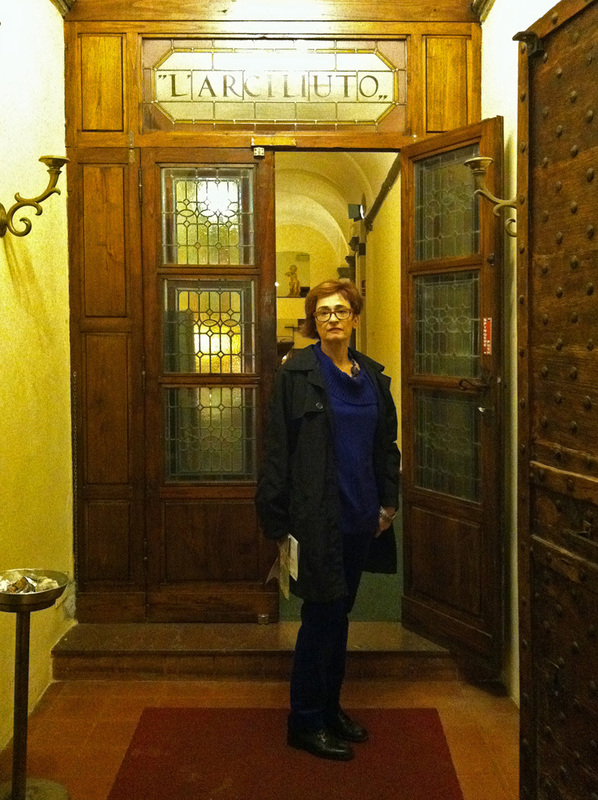 When a young artist from Urbino named Raphael came into Rome, he stayed at his patrons’ palazzo. Or so the legend says. In Rome, legends do matter. The arts speak, and the fresco inside the L’Arciliuto does look like a work from Raphael’s workshop. Though badly damaged by centuries of pollution and neglect, the Madonna with the Child are Raphael-like: graceful and poetic. Even if the Dukes and Raphael would have never set their feet inside that romantic palazzo, it is the Maestro himself, Enzo Samaritani who brings together 2,200 years of cultural traditions in his poems, ballads and music. Though closed on that October Thursday, L’Arciliuto opened its doors just for us and our friends. We were treated to a very tasty home-made traditional Roman buffet, wonderful wine and champagne. The home-made cake was to die for. 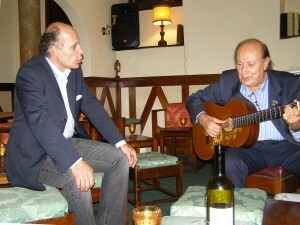 But the main treat was a private concert performed by Maestro himself and his son Giovanni. 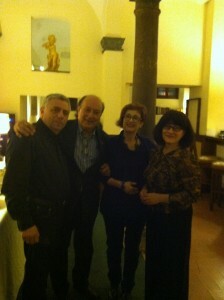 When planning a special event, go to Rome and contact Maestro Enzo! His e-mail is: enzo@arciliuto.it. Just let him know that Irene and Alex sent you and you will be treated to an evening you will never forget. Check out their website for programs and upcoming events at http://www.arciliuto.it/en/programmazione/spettacoli.html. L’Arciliuto is located at Piazza Montevecchio 5, a few minutes from Piazza Navona. Watch for our upcoming blogs on Maestro himself! Enzo Samaritani greets us inside the restored Ducal palace. Column in the background dates 2nd century BC. 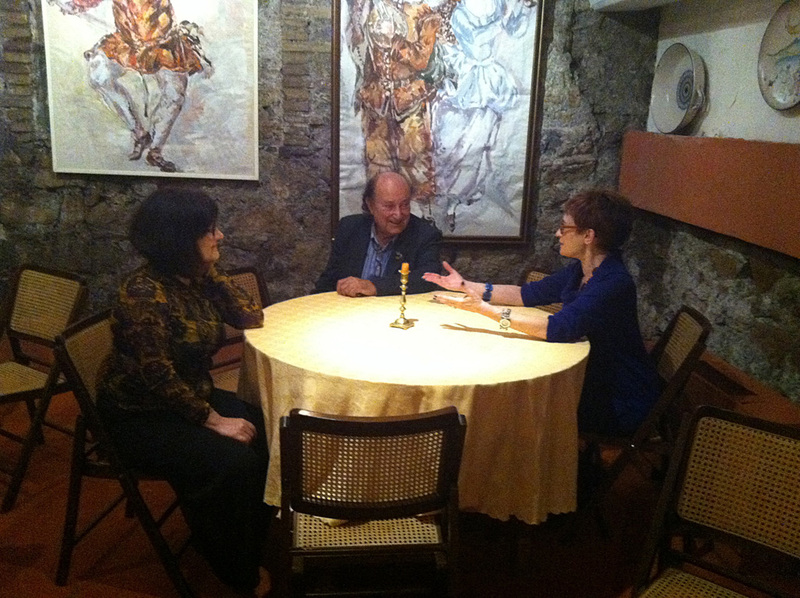 Enzo, Irene and Rachel on the lower level in what used to be a 2nd century BC Roman villa. This entry was posted in Art and Artists, Italy, Travel Tips and tagged artist, Italy, restaurant, Rome. Bookmark the permalink.